Mission: NASA Earth Observation's (NEO) mission is to help you picture climate and environmental changes as they occur on our home planet. About: NEO, celebrating its 10th anniversary in 2015, is a system that delivers global imagery of NASA Earth science data. The system was developed to meet the needs of an audience that has a desire to use images of NASA data but does not have the expertise or tools to locate, download and process the data themselves. This audience includes museums, science centers, formal and informal educators, professional communicators and many others. NEO delivers imagery through three different vectors — website, web services (WMS) and ftp — and since its establishment in 2005 has served 52 million images (~15TB). NEO has been at the forefront of providing imagery from Earth science data since its inception and has been influential in encouraging and promoting the use of data imagery. Reason you participate in ESIP: NEO has participated in ESIP over the years because it provides common-ground to meet like-minds across several U.S. agencies and science and educational institutions. NEO has made and maintained many long-lasting connections through ESIP. 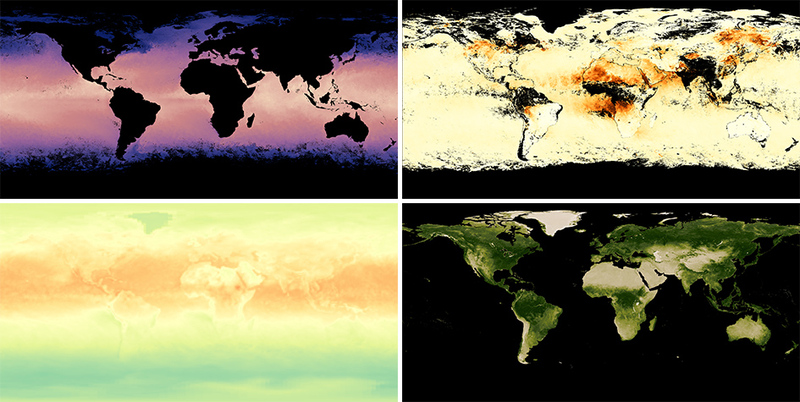 Figure 1: Clockwise from top left: sea surface temperature, aerosol optical depth, net radiation, vegetation index.